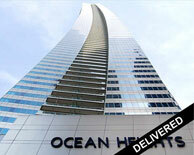 Ocean Heights is a supertall residential skyscraper in Dubai Marina, Dubai, UAE. The tower stands 310 m (1,017 ft) tall with 83 floors.The tower is designed by Andrew Bromberg of Aedas.The building was topped-out on 22 December 2009,and completed in 2010. Currently Ocean Heights is the fifth tallest residential building in the world, and fourth tallest residential building in Dubai, behind The Marina Torch, and HHHR Tower. The tower, with its unique curves and twisting motion as one ascends, is actually the third version of the tower proposed by DAMAC Properties Co. The first version had the tower at a much shorter 38 floors, the second had 50.The 83 floor tower houses more than 519 condominiums and is located along Al Sufouh Road in Dubai Marina.